While the path homeschoolers follow through high school may be very similar or radically different than their public school counterparts, all applicants are in much the same boat when it comes to college admissions. The big challenge, of course, is how to impress an admissions officer enough to receive an acceptance letter from the student’s school of choice. But a homeschooler without a GPA, class ranking, or high school transcript poses a unique challenge to any admissions office. Many colleges and universities these days are notably more flexible than in the past about evaluating homeschooled applicants. Some accept portfolios of student work in lieu of the usual requirements, but a list of high school coursework, in one form or another, is usually necessary. That is where a transcript comes into play, a written record of the grades received or aptitude achieved in each course or area of study. High school transcripts prove useful for more than college admission. They’re used for enlisting in the military, applying for jobs and internships, and even earning the “good student” discount for a family’s auto insurance rates. It’s also useful to have a transcript for the many scholarship applications that require one. The most common need for a transcript is college admission. But admissions policies vary widely, so when a homeschooler narrows down their list of potential colleges, it’s smart to do your research and find out exactly what they’re looking for. At one end of the spectrum, Harvard doesn’t require transcripts at all, and at the other end, some colleges want high school transcripts to be aligned to state standards set by their Department of Education. Most schools will fall somewhere in between, and it’s up to the applicant to find out where. For example, Wesleyan College in Connecticut has admitted homeschoolers with simply a portfolio of the student’s high school work, but they prefer a transcript, and the more detailed the better. Ohio State University does require an official transcript, and Southern Methodist University not only requires a transcript but also makes homeschoolers take several exams that are not mandated for other applicants. Each school has a different set of requirements, which are easily ascertained by contacting the admissions office. 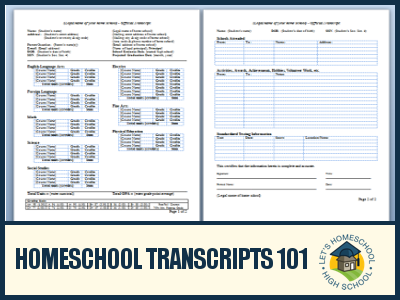 Some schools will accept a spreadsheet format, easily compiled on a home computer. Others want courses listed by semester, or perhaps including course descriptions so they know exactly what material was covered. There are both fee-based services and free downloadable templates available online designed to make the chore of writing a transcript easier, but keep in mind there is no “one size fits all” approach, and each college could require something different. As homeschooling continues to gain popularity, homeschoolers will increasingly compete with traditional students for a limited number of college openings. Considered together with many other criteria, such as SAT or ACT scores and extracurricular activities, high school transcripts serve an important role that homeschoolers cannot ignore. College bound homeschoolers should keep detailed records beginning by 9th grade, and be ready to translate those records into whatever format needed to compete with the ever-changing college admissions process.